On Saturday, September 7th we had a sudden violent rainstorm blow in. It came out of no where. It was the same day Aaron opened his mission call in the back yard. The morning was sunny and warm. The evening downpour only lasted about an hour, but we had almost 2″ of rain. It felt like the heavens opened and water poured from the skies. The BYU football game was delayed 2 hours, then the storm cleared, and we headed to the stadium. Our neighborhood lost a few trees and branches, but had no flood damage. I didn’t think much of it until a day or two later when I started watching news reports and video clips of the damage done during that short weather burst. Below is an email and photo I received the Monday after the storm from a former member of my Family History classes. Tomorrow I’ll be teaching a lesson on how to organize computer files and digitizing records to preserve them. It’s time to share her story. I haven’t forgotten you. You didn’t mention that this work was addictive, the word gets out, and before you know it you are sucked in and you can’t even sleep at night! I still consider the time I spent in your classes as one of my life’s choices blessings. Your classes were very informative, always inspiring, and so motivating. I have recommended your class to many people. I am busy trying to do just some of the things you have taught me. There is always so much more to do. Attached you will find a picture that I thought you could use as an illustration for one of your lessons. We were flooded last Saturday night. In fact there were 80 homes in our neighborhood that had water in their basements. [She lives right below the Orem Costco in the Riverbottoms.] The city streets turned into rivers when the storm drains plugged up with debris. Water spilled over the curbs and filled up window wells, windows broke and basements flooded. Not fun! This photo was taken in my living room. And no, largely thanks to your class, these are NOT my pictures. These belonged to by sweet neighbor, a widow, in her late 70’s. Her basement had 2 1/2 feet of standing water, just enough to soak everything. This included her cardboard boxes full of pictures, memory books, genealogy etc. It took me, and a few kids, several hours to separate the soaking wet pictures to try and dry them out to save them. We did pretty well, but others were so stuck together they were a loss. The hard part is, that almost all of these pictures were in albums and labeled. I couldn’t take the time to write down the information on the photos as I peeled them away from the wet scrap book pages. When photos become wet, they turn to glue and stick together. If they dry, you cannot pull them apart without totally damaging the photos. Hopefully she can still recognize the people, places and things and get it all sorted out. I saved what I could of the scrap book pages, but the pages were less stable than the photos. Tragic! Bottom line, scan your items and store them in a digital form. Place the originals in water tight containers on shelves in the upper floors of your home, not your basement. It is hard to sort through water soaked containers and give priority to those things that can’t be replaced. Especially if they are buried in boxes underneath the stairs of your water filled basement. 3 Responses to Preserve Your Treasures! What a shame, all those pictures ruined. I hope many were able to be saved and relabeled. So sad. 🙁 At least they were able to save some. Thanks for sharing these footages. Frank and I got to the stadium just as the storm was winding down, but still had to wait the two hours before it started. Luckily, I took a book with me. Love your blog. Reading it makes me want to do better. You are truly amazing! 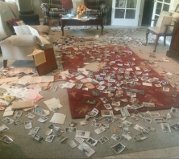 I would die if I lost all of my pictures. Thanks again for all your help, teaching, and coaching!